Why Would You Need a Bluetooth Motorcycle Helmet Speaker? If you are looking for a Bluetooth motorcycle helmet speaker or a Bluetooth-enabled helmet with built-in speakers, this article is a great place to start your search and learn something about these devices. We have already explored the market for you, found the most reputable brands and the most popular products, tested them, and made a list of 10 best Bluetooth motorcycle helmet speakers. If you don’t want to deal with the installation (although it’s not a huge hassle), there’s a section of this article for you – we have also made a list of 5 best Bluetooth-enabled helmets with built-in speakers and mics. All the text before and after the list of 10 best Bluetooth motorcycle helmet speakers is dedicated to those who don’t know anything about motorcycle helmet speakers and those who want to learn more. We have prepared a lot of useful info about Bluetooth motorcycle helmet speakers, their advantages and disadvantages, their features, and things to pay attention to when buying them. If you are already familiar with these devices or if you prefer ‘’in medias res’’ approach, you can immediately jump to the reviews. For a biker, there is nothing more enjoyable, more liberating and invigorating, than riding a motorcycle across the country, listening to the sound of the bike, and enjoying the scenery. It cannot get any better than that, right? Well, actually, it can. What if you could listen to your favorite song while riding? Just imagine Lemmy Kilmister screaming into your ears ‘’ On Iron Horse he flies, on Iron Horse he gladly dies, Iron Horse his wife, Iron Horse his life’’ while riding across the Mojave Desert. It’s a pretty cool picture, right? Sure, you can use wired or wireless earbuds, but that would be inconvenient, especially if you are using the wired ones. Even wireless earbuds are inconvenient and can interfere with your helmet. Using something that was specially designed and made for the motorcycle helmet, something like Bluetooth motorcycle helmet speaker is the most convenient solution you could possibly find. And that’s the first reason to buy it. Furthermore, most Bluetooth motorcycle helmet speakers on the market (and on our list) are, in fact, Bluetooth kits similar (in terms of functionality and features) to the car Bluetooth kits. They can be wirelessly connected to your phone or to multiple Bluetooth-enabled devices (phone, mp3 player, GPS, etc.) and you can easily switch between different devices by pressing a button. So, you can integrate all your devices with your helmet, answer/make calls or ask your GPS device for directions. Most of the Bluetooth motorcycle helmet speakers/kits feature built-in mics and voice prompts which means that you don’t have to pull off the road to make a call or set your GPS (it’s still advisable to do that). You just have to press the button and speak. Also, in case you are riding in a pack, you can communicate with other members via intercom. Not all the speakers support this feature, so you should check the specs and see if this is possible. So, it’s not only about listening to music. Bluetooth motorcycle helmet speakers are so much more than just speakers. They are very simple, easy to use, multipurpose devices that can make your ride more enjoyable and, even more importantly, they can make it safer (your hands will be on the handlebars most of the time). First of all, they improve your safety. Answering a call while riding a motorcycle is very dangerous, especially if you are using your phone instead of some kind of earbuds or headset (wired or wireless). The very idea of looking into your phone while riding a motorcycle is absolutely reckless. If you really have to answer/make calls while riding, some Bluetooth motorcycle helmet speaker is a much better, more convenient, and safer solution than anything else. The only safer option is not to make/take calls while riding at all. Just to be clear, we are definitely encouraging you to avoid making and answering calls while riding (even if you are equipped with a Bluetooth motorcycle helmet speaker). Another great thing about Bluetooth motorcycle helmet speakers is that they can be paired with multiple devices simultaneously (multiple phones, GPS devices, and other Bluetooth-enabled devices) and you can easily switch between the devices depending on your current needs. Also, some Bluetooth motorcycle helmet speakers allow you to communicate with other members of your pack (in case you prefer riding in a pack). This is called intercom feature and usually utilizes radio waves or Bluetooth connection. Not all the Bluetooth motorcycle helmet speakers have intercom and if you need it, you should choose carefully and check the specs list (or read our reviews). In the end, there’s the most obvious thing. Bluetooth motorcycle helmet speakers are the most convenient option for listening to music. Some truly wireless earbuds could also do the job but you never know how uncomfortable they can be in combination with the helmet. First of all, it is important for you to know that using Bluetooth motorcycle helmet speakers for making/answering calls while riding is not perfectly safe. It’s safer than using your phone while riding, but it’s not safer than not talking on the phone. The National Safety Council claims that your brain activity (or focus) decreases by up to 1/3 when talking on the phone while driving (the same thing applies to riding ). So, the best option is to avoid answering or making calls while riding a motorcycle. Another disadvantage, or rather an inconvenience, is the fact that all the members of your pack have to buy the same type of motorcycle helmet speaker or Bluetooth-enabled helmet (or at least the same brand) in order to use the intercom feature. The manufacturers are trying to make you buy their helmets and keep you within their ecosystem which is not fair but you can’t do anything about it. If you are prepared to pay more, there are some high-end devices that allow you to communicate with any other Bluetooth communication device made by any manufacturer. You can find some of those devices on our list. This is our selection of 10 best Bluetooth motorcycle helmet speakers in 2019. Sena is one of the industry leaders when it comes to motorcycling and cycling equipment. Their Bluetooth motorcycle helmet speakers and smart helmets have been highly praised and very popular among riders and cyclists. One of their latest series of Bluetooth helmet speakers/kits is 20S series. 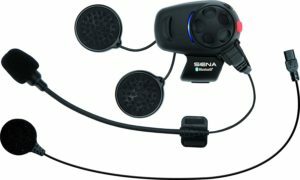 Sena tried to pack an amazing number of features inside one small device and the results are pretty good, but there are some annoying flaws that could discourage you from buying this device. You can buy a single device for around $250 or buy two (dual pack) and get a nice discount. Sena 20S-01D comes in a nice cardboard box with numerous accessories included. You will get the main unit, helmet clamp, three microphones (static boom mic, wired boom mic, wired mic), dynamic speakers, micro USB charging/data cable, car charger (for use on the go), 2.5mm to 3.5mm audio cable, mounting adapter, foam covers and Velcro pads for the speakers, Velcro pads for the mics, and a hex key (for the installation). You will also get the user manual (you will spend a lot of time reading this material so you should try not to lose it) and a 2-year warranty. The only thing they forgot to include is the wall adapter for charging. 20S-01D features an interesting aerodynamic shape. It’s small and unobtrusive. Installing the unit onto the helmet takes just a few minutes– attach the clamp to the helmet and tighten it up and then attach the main unit to the clamp. The main unit, as well as the clamp, is made of hard and thick plastic and look pretty solid. The controls are not as simple as we would like them to be. There are 3 buttons and one knob (Sena calls it Jog Dial). The jog dial button is on the front side of the main unit surrounded by the jog dial. There’s another (phone button) on the back side of the main unit. Also, there’s a so-called ambient button on the bottom of the clamp and when you press it, it will pick up the sound from your surroundings and transfer it to the speakers so you don’t have to remove your helmet to hear someone talking to you at the gas station. It’s a nice and very useful additional feature. We were not quite happy about the fact that you have to control so many features (calls, music playback, GPS, FM radio, intercom, etc.) with only three buttons (the ambient button has only one function). It can get pretty confusing and it takes a lot of time, reading, and experimenting to master the controls. Besides the control buttons, you can also use the voice commands. There’s an astonishing amount of voice commands and they are all listed in the user manual. In order to initiate voice commands, you can double-tap the main unit (or the helmet) or you can speak directly into the mic (you have to say ‘’Hallo Sena’’ first and say your command after you hear the voice prompt). You can use the voice commands to check the battery status, dial phone number (speed dial), redial the last number, control the playback or radio, activate the intercom, etc. The main unit has a flip-up antenna for the intercom communication. The antenna is supposed to be extracted when the intercom is active (in order to get better reception). On the back side of the unit, there’s a micro USB charging port. All the other inputs are located on the helmet clamp. Besides the inputs for the mic and speakers (both mic and speakers are detachable), there are also two ports (2.5mm and 3.5mm) for the earbuds (you can use some wired earbuds instead of the speakers) and for connecting non-Bluetooth devices with AUX output. This unit utilizes Bluetooth 4.0, which is one of the newer Bluetooth versions and it delivers a significantly better performance than Bluetooth 2.0 or 3.0. You can pair two Bluetooth-enabled devices with the unit (2 phones or phone and GPS device) which is a great and very convenient thing. The unit can also be paired with some older Sena communication units like SMH10 and SMH5. The intercom feature is also supported and you can pair up to 8 devices together and have a group chat while riding. The advertised range is 1.2 miles but we were not impressed with the actual range and this is our greatest concern (and greatest disappointment). Sena 20S-01D supports audio multitasking which means that two features can be active at the same time. For example, you can talk to the other members of the pack while listening to music via Bluetooth. Some features (like intercom) have the priority over other features but you can also change the priority settings (you have everything thoroughly explained in the user manual – Section 19). The unit features a Li-ion rechargeable battery. It can deliver up to 13.5h of talk or listening to music or up to 10 days in standby mode. The recharge takes 2 hours. The speakers are not impressive. They are not loud enough and their bass response is below average. The mids (especially the vocals) are probably the greatest highlight when it comes to sound. The good thing is that you can always switch to earbuds and forget about the speakers. The microphone, especially that static boom mic, delivers an exceptional performance, even in a noisy environment. The noise canceling feature works very well and your voice will be loud and clear on the other end. On top of all the existing features, there’s also the Sena Utility app (available for Android and Apple devices). You can use this app to set up the device (initial and basic settings), set radio stations, voice commands, volume, configure groups, etc. The app is nice but it’s not very user-friendly. As we’ve said, the intercom range is our greatest concern. It’s advertised that the max range is 1.2 miles, but in reality, it’s much shorter. We couldn’t even get half a mile (with the extracted antenna). It looks like you have to be in the line of sight with other group members if you want to communicate with them. The manufacturer doesn’t offer any info on the water resistance or waterproofness of the device. The device is not IPX certified and we strongly believe that this kind of devices should be at least water resistant. If the device gets wet, it will shut down automatically and you will have to dry it off before you turn it back on. Unlike the installation, the initial setup and usage are not as simple as we would like it to be. You will have to spend some time reading the manual and watching ‘’how to’’ YouTube videos before you master the controls. Most of the features work fine once you figure out how to use them, but the device is not easy-to-use. We’ve had some issues with the voice commands right out of the box, but once you upgrade the firmware, most of the voice command issues disappear. SMH10-10 is one of the older Sena headset models. It’s significantly cheaper than 20S headset (priced under $150) and it offers pretty decent performance for the price. Naturally, you won’t get as many features as you would get with the 20S (shorter intercom range, a smaller number of members in intercom communication, absence of ambient button, etc. ), but that’s all normal and expected considering the price difference. The packaging looks really nice. You will get the main unit (the part with the controls), the clamp unit, two detachable mics (boom mic and wired mic), two small dynamic speakers (attached to the clamp unit), USB to micro USB charging/data cable, car charger, AUX cable, glued surface mounting adapter, mic sponges, speaker pads, and a hex key. You will also get the user manual and 2-year warranty. In terms of design, SMH10 is similar to 20S, but it has a thicker profile and it’s a little bit bulkier. It is available in black color only. The installation is smooth and hassle-free. It’s supposed to go on the left side of the helmet and it can be mounted on most helmet types. If you know what you’re doing, you won’t need more than 15min to install everything. The control buttons are basically the same as the controls on the 20S. You have a jog dial button/dial (on the face of the unit) and phone button on the back side of the unit. You can use these buttons to turn on/off the unit, pair with Bluetooth-enabled devices, connect and communicate with other group members via intercom, control the playback, answer/end/make/reject/transfer calls, etc. Controlling everything with only two buttons and one knob can be a little bit confusing at first and you will need some time to get used to the controls. Instead of the control buttons, you can use the voice commands. The number of possible commands is not as large as it was with the 20S, but it’s satisfying. You can at least answer/make/transfer calls and activate/end intercom communication. The device utilizes Bluetooth 3.0 + EDR which is not as good as 4.0 and newer versions (in terms of sound quality and battery durability) but still delivers a satisfying performance. The pairing process is smooth and quick. Unlike 20S, SMH10-10 doesn’t support NFC pairing. Multi-point pairing is possible – you can pair two Bluetooth-enabled devices simultaneously (pair two phones, phone and GPS device, etc.). You can also connect non-Bluetooth audio sources via AUX port on the back side of the unit. The intercom feature is also present. You will be able to connect with up to 4 group members and communicate with them. You can communicate with all of them at the same time (conference intercom). The advertised range is 900m (980 yards). The device also supports audio multitasking, which means that you can listen to the music and stay connected (via intercom) with other riders. Certain features/connections are prioritized (for example, intercom and phone calls have the priority over Bluetooth streaming) and if someone talks to you via intercom, the music playback will be paused. The battery offers satisfying performance. You will get up to 12 hours of playtime/talking or 10 days in standby per one charge. Recharge takes 2.5 hours. The speaker performance is not amazing. It’s more mid-centric than anything else. The bass is almost nonexistent. The highs are present but kind of bright. The speakers are not as loud as we have expected. The microphone, especially the boom mic, delivers an above-average performance. You can ride at 60mph and have an uninterrupted conversation. The mic does a great job at isolating the ambient noise – the person on the other end will hear you loud and clear. Just like the 20S, SMH10-10 is not IPX-certified. So, it’s not waterproof or water resistant. The smartest thing would be not to use it if it’s raining. If it gets wet, shut it down and leave it to dry off. Controlling everything with only 2 buttons and one knob can be a bit confusing. You will need to read the manual carefully and learn how to pair with Bluetooth devices and with other SMH10-10 devices via intercom, but once you get used to controls, it will be much easier. After two expensive products, here’s something much more affordable. FredConn TCOM-SC is priced under $60, or you can buy two for about $110. This device is maybe not as capable and versatile as the previous two, but you get what you paid for. FredConn TCOM-SC comes in a much more modest packaging than Sena headsets. It doesn’t look bad but, compared to the previous two headsets, you won’t get as many accessories. 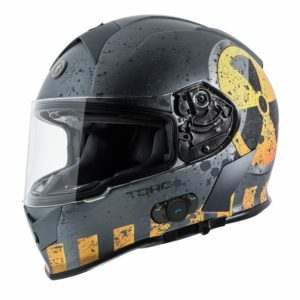 The package includes the main unit (the part with buttons that goes on your helmet), clamp unit with screws, screwdriver, detachable stereo speakers with mic, USB to micro USB charging cable, 4 adhesive speaker pads, user manual, and 1-year warranty. In terms of design, this device looks slimmer than Sena headsets. It’s also lighter and less rugged than Sena. FreedConn TCOM-SC definitely looks less durable and less rugged than Sena devices. So, if you want to pay less, you will definitely have to make some compromises. The good thing is that the compromises are not huge. The installation is pretty simple. You can clamp it to the helmet and tighten it up or you can stick it to the side of the helmet. On the bottom of the main unit, there’s a headphone jack/charging port. The mic and the speakers are connected via cable and they cannot be separated but you can detach them from the main unit in case you need to replace them. There’s no additional AUX port for connecting other non-Bluetooth devices. The installation should not take more than 10-15min. When it comes controls, the FreedCon TCOM-SC is very similar to the SMH-10. You have two buttons (power/intercom button and call/playback button) and one knob (volume/next song/previous song). All the buttons are located on the front panel and between the buttons, there’s a small LCD screen. This is not an absolutely necessary feature since you won’t be able to see it most of the time, but it’s nice. You won’t be able to use voice commands to control the playback and communication. The are some confusing info on the Bluetooth version. The product description on Amazon claims that it features Bluetooth 3.0 while the user manual says Bluetooth 2.1. Anyway, pairing is fast and takes a few seconds. You cannot pair multiple Bluetooth-enabled devices simultaneously (multipoint pairing is not supported) – you can only connect one Bluetooth device (either smartphone or GPS device). FreedCon TCOM-SC features intercom, but you will be able to connect only three devices and only two can communicate at the same time (no intercom conference). The advertised range is 800m (875 yards). If you are riding in a group and intercom is important to you, Sena and Cardo devices are a much better choice. The device features one rechargeable Li-ion battery. The battery delivers 7h of intercom talk, 10h of phone talk, or 300 hours in standby mode. The recharge takes 4h. The speakers/headphones are actually louder than those on Sena SMH10-10 and 20S. The bass response is not that impressive, but the bass is definitely more present than on previously reviewed Sena headsets. The microphone delivers an impressive performance. It isolates/attenuates a significant portion of ambient noise and it doesn’t muffle your voice. The device is flimsier (all the parts including the clamp are made of plastic) than more expensive devices and you will have to handle it carefully if you want it to last. FreedCon TCOM-SC doesn’t feature Bluetooth multipoint pairing. You can only connect one Bluetooth-enabled device at a time. Intercom conference is not supported. You can connect three devices via intercom but only two can communicate simultaneously. SMH5-UNIV is one of the cheapest Sena headsets on the market. It’s priced under $100. This is a good substitute for SMH10. In terms of performance, it’s slightly worse than SMH10 (no intercom conference, shorter intercom range), but it’s significantly better than FreedConn TCOM-SC (better durability, multipoint Bluetooth pairing, up to 4 devices connected via intercom, etc.). The packaging includes the main unit, clamp unit, glued surface mounting plate, helmet speakers, detachable boom mic, mic equipment (fastener, mic holder, mic sponges), USB to micro USB charging cable (wall adapter is not included), and speaker pads. You will also get the user manual and a 2-year warranty. SMH5 is basically a baby brother of the SMH10. In many ways, it looks the same as SMH10, but it’s slightly smaller and lighter. They are similar in terms of design and build quality. The jog dial looks exactly the same. When it comes to installation, there’s nothing out of the ordinary. You have to attach the unit to the helmet and find the right place for the speakers and for the mic. If you don’t want to, you don’t even have to attach the mic since the mic is not permanently connected to the speakers. The controls look exactly the same as the controls on SMH10. You have a multifunction jog dial/button and a phone button. You have to use these buttons to turn on the headset, pair it, activate intercom, answer/end/reject/transfer calls, control the playback. It will be tricky at first, but after some time you will master the controls and it won’t be that hard. The device features Bluetooth 3.0. Pairing is done in seconds (no NFC pairing – you have to do it the old way). You can pair two Bluetooth-enabled devices simultaneously (multipoint pairing) so you can pair it with your phone and with your GPS device at the same time. SMH5 does not feature an additional AUX port for connecting non-Bluetooth devices. SMH5 also features intercom. You can connect up to four devices but you can only talk to one group member at the same time (no intercom conference) and the member has to be within 400m (430 yards) range. The built-in battery delivers a significantly shorter talk time than SMH10. You will get up to 6 hours of talking and 150h in standby mode (about half of what you get with SMH10). The recharge takes 1.5 hours. The speakers are surprisingly loud. You won’t be impressed by the bass but it’s there. The emphasis is on the midrange frequencies and voices. As all the Sena headsets, SMH5 has a pretty good noise-canceling mic. It delivers more than satisfying performance. SMH5 does not support audio multitasking – you cannot listen to music and have intercom active in the background. If you prefer long rides, you need something with a stronger battery. This one can deliver up to 6 hours of talk time. SMH5 doesn’t support all those fancy advanced features you would get with more expensive headsets (intercom conference, voice commands, etc.). After all, that’s the reason why SMH5 is so much cheaper than SMH10 or 20S. The package looks nice. Depending on your needs, you can order a single or dual pack. The packaging includes the main unit, the cradle that’s supposed to be attached to the helmet, spring clip (for attaching the cradle to the helmet), two mics (boom mic for open-face helmet and button mic for full-face helmet), a pair of speakers, speaker and mic accessories (Velcro tapes, boom mic foam, button mic pads), USB to micro USB charging cable, user manual, operation instructions, and 1-year warranty. Wall adapter is not included. In terms of design, LX-B2 is not different from the previously reviewed devices. It’s slightly slimmer and lighter than Sena headsets, but the basic aerodynamic shape of the device is the same. It’s made of plastic, but some parts of the main unit are rubberized. The overall build quality is on par with the price. Naturally, you will get more rugged build if you pay more, but for the price, you can’t expect anything better. The controls are quite simple and easy to use. You have every single step and every single command nicely explained in the operation manual. There are four buttons – two on the top panel are volume/track buttons, and two on the front side are the intercom/Siri button and function/call/play/pause button. The micro USB charging port is on the back side. The buttons are large enough and easily accessible. The unit itself doesn’t feature voice commands (that’s reserved for high-end devices), but you can activate Siri or S-Voice (Samsung voice assistant) by pressing the intercom button. 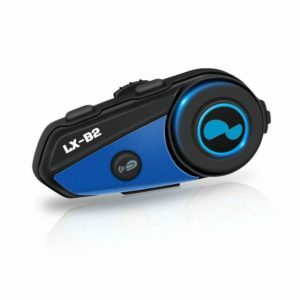 LX-B2 features Bluetooth 3.0. The pairing process is simple and takes 5 seconds. You can pair the headset with any Bluetooth-enabled device (phone, GPS device, mp3 player, etc.). The only problem is that you can’t connect two devices at the same time (you can’t pair your phone and your GPS and listen to some music and get GPS directions at the same time). The device will automatically pair with the last paired device when they are in range. The device features intercom but you can only connect two units together. If you prefer riding in a group and if you want to be able to communicate with 3, 4, or multiple group members, this is not the device for you. The intercom range is also problematic – you have to be less than 10m away from the other driver in order to use the intercom. Phone calls and intercom calls have the priority over the music playback. If you are listening to a song and there’s an incoming phone call, the music will be paused. The speakers are not the most impressive part of this unit. The bass is really weak and the mids are emphasized. There’s a noticeable roll-off in the treble region. The mic delivers a pretty good performance. It does isolate most of the noise at 60mph, but if you are driving faster than that, it will pick up some noise and it will muffle your voice a little bit. The microphone does the job well. LX-B2 doesn’t support multipoint Bluetooth pairing and it doesn’t support intercom conference. You can only communicate with one rider via intercom. The intercom range is probably the biggest issue – 10m (33ft) is really short. This device doesn’t feature FM radio which is not such a big deal for us, but it might be a deal breaker for some people. The manufacturer claims that the device is waterproof and weather resistant but there is no info on the IPX rating/certification in the user manual. Cardo is another industry leader (along with Sena) when it comes to Bluetooth motorcycle helmet speakers. PACKTALK is their high-end flagship communication system. This is an amazing but also quite pricey little device. The single pack is priced around $200, but you can buy a dual pack for less than $330. It’s definitely more cost-effective to buy two at once. 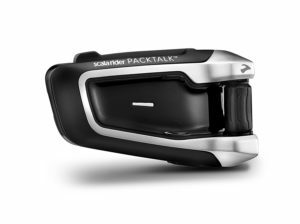 In terms of performance and number of available features, PACKTALK is even better than Sena 20S. The actual rival of PACKTALK is the latest Sena headset called Sena 30K but we still prefer PACKTALK because it’s a bit more reliable when it comes to riding in a group. If you are riding in a larger group of up to 15 people, PACKTALK should be your go-to communication device. The headset is nicely packed inside a leatherette box. Inside the box, you will find the main unit, the clip unit for attaching the device to the helmet (Cardo calls it audio kit because all the audio inputs/outputs are on this unit), 2 40mm JBL speakers, 2 mics (wired and boom mic), USB to micro USB charging cable, all the necessary installation equipment (glue plate, Velcro pads, speaker relocators), user manual, and 2-year warranty. In terms of design, all these devices are shaped similarly, but what’s special about this unit is that it looks and feels much sturdier than any other communication device we’ve tested. It’s solidly built and extremely durable. Unlike many other communication devices, this one is actually waterproof and dustproof (IP67-certified). All the other devices are weatherproof or ‘’kind of water-resistant” but only Cardo PACKTALK communication devices are actually tested and certified. In terms of design, you should probably know that it has a slimmer profile than Sena 30K, and it’s slightly smaller and lighter. The installation doesn’t take too long if you know what you’re doing. We’ve done it in 15 minutes. If you are not sure how to do it correctly, there’s a lot of YouTube videos with all kinds of installation tips. Just like Sena 20S, PACKTALK has a flip-up antenna. The micro USB charging port is located on the bottom of the main unit and it’s sealed with a rubber flap. All the control buttons are on the front side. You have three buttons (intercom button at the top, phone button at the bottom, and play/pause button) and a roller wheel. There’s a bunch of different functions assigned to these buttons. Instead of using the buttons, you can use the voice command. You can find the list of available commands in the user manual. All the commands work nicely and almost flawlessly. PACKTALK also features self-adjusting volume – the device will calculate the optimal volume based on the speed and ambient noise. PACKTALK features Bluetooth 4.1 and can be connected to two Bluetooth-enabled devices simultaneously. The pairing is simple and takes a few seconds and the headset will automatically pair with the last paired device. Intercom is one of the top features of the PACKTALK system. There are 2 intercom modes – Bluetooth intercom and DMC (Dynamic Mesh Communication) intercom. In Bluetooth intercom mode, you can communicate with 8 other riders and you can have intercom conference with up to 4 riders (2 of them can talk at the same time and the others can only listen). In Bluetooth intercom mode, you can communicate with other Cardo and non-Cardo communication devices. The max range in Bluetooth intercom mode is 1 mile (under ideal conditions). DMC Intercom is the preferred option for riding in a group. You can connect up to 15 devices in a group and 6 of them can talk at the same time. The maximum range depends on the number of riders. If there are only 2 riders, you can be 1 mile away from each other, but if there are at least 4 riders, the range extends up to 5 miles because each device receives the signal and then repeats it. Another interesting feature in DMC mode is the DMC bridge. This feature allows other riders with a Bluetooth intercom communication device or a caller to join the previously created PACKTALK group (if there are available slots). What’s great about DMC mode is the fact that the network doesn’t fall apart if one of the riders leaves the network. If the riders are previously assigned to a group, they can leave and join the network whenever they want. There are multiple ways to perform the initial settings, change your preferences, update the firmware (this is the first thing you should do when you open the box), create a group/pack, etc. The preferred and the easiest way is the Cardo SmartSet app (available for Android and Apple devices) but you can also do that through Cardo Community web service, or through the user menu (which is the hardest way). Finally, this little device also features FM tuner with 6 presets. The built-in rechargeable battery delivers up to 13h of talking. The recharge takes up to 3 hours. PACKTALK has two 40mm JBL speakers. They are probably better than any generic pair of helmet speakers but even these speakers are not perfect. The mids and voices are crystal clear and that’s the most important part. The mic, especially the boom mic is pretty good. It managed to isolate most of the noise at 60mph. Riding at higher speeds could be problematic – the mic will pick up more and more ambient noise as the speed increases. We didn’t like the user manual very much. It’s comprehensive but not very user-friendly. It’s probably smarter to look for some helpful YouTube channels like MotoGeek Freak or Cardo Scala Rider and find the answers to all your questions. The number of available features is really impressive but make sure to learn everything before you go on a ride. Trying to figure out how to search for radio stations or how to go from Bluetooth to DMC intercom while riding can be really tricky (and also very dangerous). Sena SMH10R is a modification of the previously reviewed SMH10. In terms of features and functionality, it’s practically the same as SMH10. The only real difference is the lower profile. SMH10R comes in a simple cardboard box with SENA logo on it. The package contents are pretty much standard. You will get the main unit with three cables attached to it (charging cable connector, mic connector, and speaker connector), 2 speakers, 2 mics (boom mic and wired mic), battery pack, USB to micro USB charging/data cable, cigarette charger, and all the necessary installation equipment (sponges, Velcro pads, adhesive tapes, etc.). You will also get the user manual and 2-year limited warranty. In terms of design, SMH10R is different than other devices from the SMH series. It’s much slimmer and it doesn’t have a jog dial. Whether you like it or not is up to you and your personal preferences. When it comes to build quality, we are not impressed. It seems solid enough but we have expected something more rugged considering the price. The manufacturer claims that it is weather resistant, but there is no IP or IPX certificate to confirm that. Only Cardo devices are IP-certified. This device won’t break if it gets wet, but it is not fully waterproof. All the control buttons are located on the front side. There are three buttons (+, -, and center/SENA button). The buttons are large enough, responsive, and easily reachable. You can use the + and – buttons to control the volume. SMH10R doesn’t feature voice commands, but you can answer a phone call or start an intercom conversation with your voice (first, you have to enable voice-activated phone answering/intercom). SMH10R features Bluetooth 3.0. and supports multipoint pairing which means that you can pair two Bluetooth-enabled devices with the unit at the same time (two phones or phone and GPS). The pairing is done in a few seconds. SMH10R features intercom and intercom conference with up two 3 other riders. It’s a great device for people who prefer riding with friends but if you are a member of a larger group of riders, you should buy something that allows more participants (Sena 20S, Sena 30K, Cardo PACKTALK, or PACKTALK BOLD). SMH10R allows you to communicate with riders using other Sena and non-Sena communication devices. The intercom range between two riders under ideal conditions is 900m (980 yards), but in reality, you will get 400m at best. The battery delivers up to 8 hours of talking per one charge. It takes 2-2.5h to recharge the battery and the good thing is that you can charge it on the go and you can use it while charging. The microphone delivers very good performance. It isolates most of the noise at 60mph. Higher speeds could be problematic but it’s not absolutely impossible to make a call. Assigning too many features to one button (center button) is always problematic and requires some experimenting and learning. You will need some time to master the controls and learn how to do different things. Also, the manual is not the most helpful reading material – finding a YouTube tutorial is a better solution. The sound quality is pretty bad. If you like bass-heavy music, you will be absolutely disappointed. We haven’t expected much but these speakers are pretty bad. The mids and vocals sound natural and clear – if you are going to use SMH10R for phone calls and communication with other riders, this device is good enough. You can get a much better performance and more features if you pay $30 or $40 more. You will be much happier with Sena 20S or 30K (at least, in our opinion). The only reason to buy SMH10R instead of Sena 20S is the slimmer profile. If that’s your main concern, go for it. 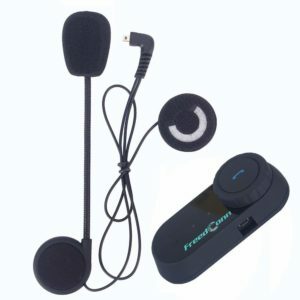 FreedConn T-COMVB is one of the cheapest devices on the market. You can have a dual pack for less than $100 which is more than affordable. T-COMVB is almost exactly the same as TCOM-SC. The only difference is that T-COMVB doesn’t have an LCD screen which is not a deal breaker considering the fact that you don’t really see that LCD while riding. The device comes in a simple box with all the key features listed on it. You will get the main unit, spring clip with fastening screws, 2 speakers with a microphone (you can choose between boom mic and wired mic package depending on the type of your helmet and your preferences), installation equipment (adhesive pads, screwdriver, etc. ), USB to micro USB charging cable, user manual, and 1-year warranty. In terms of design, there’s no difference between the previously reviewed FreedConn TCOM-SC. They both look the same and are shaped like all the other Bluetooth motorcycle helmet speakers on the list. It’s made of plastic but it looks solid enough. The manufacturer also claims that it’s waterproof and sun-proof but there’s no IP rating to confirm that. In our experience, only Cardo makes devices that are actually certified as waterproof/dustproof. All the others (including Sena) offer more or less protection against different weather conditions (they are more or less weather resistant), but they are not certified. All in all, the build quality of T-COMVB is on par with the price. The info on the Bluetooth version is somewhat confusing. The product description on Amazon claims that it features Bluetooth 3.0 while the user manual says Bluetooth 2.1. The pairing is smooth and quick but you can only connect one device at a time (multipoint Bluetooth pairing is not supported). The Bluetooth range is 10m which is more than enough considering the fact that your phone is always next to you. T-COMVB features intercom and allows you to connect up to three devices/riders together but only two of them can talk at the same time (full-duplex). Intercom conference is not supported. If you are riding in a larger group (more than 3 riders), this is not the device for you. The advertised intercom range (under ideal conditions) is 800m. In reality, you will get less than 400m (usually 200-300m). The rechargeable 400mAh battery can deliver up to 10 hours of talking on the phone or up 7 hours of intercom use. Recharge takes up to 4 hours. The speaker performance is not impressive, especially when it comes to bass reproduction. The midrange and especially the vocals are very clear and articulate (important for music but also for communication), and highs are present but not sparkling. The mic does the job (we have only tested the boom mic). It can isolate most of the noise at 70mph and the voice sounds natural and undistorted on the other end. The mic performance actually surpassed our expectations. This a simple unit that does what’s supposed to do and we have no major complaints. You won’t be able to make conference intercom calls and you won’t be able to communicate with more than two riders in a group. Also, you can’t pair more than one device with the unit in Bluetooth mode. You can’t really expect any of the advanced features (voice commands, app, auto adjusting volume etc.) at this price point. FREECOM 4 is not as advanced communication device as PACKTALK or PACTALK BOLD but it’s more affordable. In case you are riding in a smaller pack of up to 4 riders and you want to save some money, FREECOM 4 is a great choice. FREECOM 4 comes in a compact box which includes either one (single pack) or two devices (dual pack). Besides the main unit, you will get the audio kit, 40mm speakers, two mics (hybrid boom mic and wired mic), all the installation equipment (speaker spacers, Velcro pads, mic sponges, glue plate), USB to micro USB charging/data cable (wall charger included). You will also get a comprehensive user manual, a pocket guide, and a two-year warranty. This device is much slimmer and has a lower profile than the PACKTALK and it doesn’t feature roller wheel, but it still features that recognizable Cardo look. The unit is very compact and sturdy. FREECOM 4 is IP67-certified (fully waterproof and dustproof) which is a great advantage of Cardo devices over any other Bluetooth motorcycle helmet communication device. The installation is simple and it takes 10-15 minutes. You can use the spring clip or you can simply stick the audio kit to the helmet. Wiring is a bit harder than attaching the audio kit to the helmet, but it shouldn’t take more than a few minutes. There are 4 buttons (intercom button, phone/media button, and two volume buttons). All the buttons are located on the front side, they are all easily reachable, and responsive. Learning how to use the buttons and adjusting to the controls definitely takes some time (especially if you are wearing gloves), but once you get used to the buttons, there will be no problems. A small downside is that there are no voice commands, but you can at least answer a phone call by saying anything loud enough. Cardo once again managed to pack a lot of features inside a small device. FREECOM 4 is not as great as PACKTALK, but it’s more than good enough for most of the people. The device features Bluetooth 4.1 and it supports multipoint pairing. Pairing one or two Bluetooth-enabled devices with the unit takes just a few seconds and it’s nicely explained in the manual. Your phone and your GPS device can be simultaneously connected to the unit. 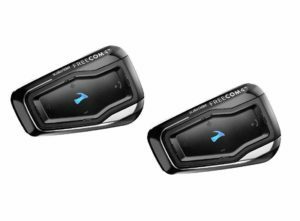 FREECOM 4 also features Bluetooth intercom and allows you to connect up to 4 riders together and have an intercom communication with all of them at the same time. Since each device has only 2 channels, pairing four devices is a little bit complicated, but it is also nicely explained in the user manual and in the official YouTube Cardo FREECOM 4 tutorial. The max range under the ideal conditions (line of sight) is 1.2km. In reality, you will get half of that range at best. FREECOM 4 can also be paired with any other Cardo or non-Cardo device in full-duplex. It may not be important to some people, but this device also features a built-in FM tuner so you can also listen to one of the radio presets while riding. In order to configure the device and adjust all the settings (pair multiple Bluetooth-enabled devices, pair intercom devices before you go on a ride, set radio presets, etc.) you can use voice-navigated menu (which is the hardest way), Cardo SmartSet app (available for Android and Apple devices), or Cardo Community web service. Some of the features (only a few of them) require a certain method. For example, if you want to upgrade the firmware, you will have to use the Cardo Community service and you will have to connect the device to your PC/Mac (you can’t do that through the app or through the voice-navigated menu). Also, if you want to set the mobile priority (when two phones are connected to the unit via Bluetooth), you will have to use the app. Battery delivers more than satisfying performance. It can deliver 13 hours of talking and can be fully recharged in 3 hours. Speakers are not the most impressive part of this unit but they do the job. The bass is tiny and the emphasis is on the midrange reproduction and especially on vocals. The speaker can get pretty loud which is important when you are in a noisy environment. The mic delivers an impressive performance (especially the boom mic). It’s capable of delivering clear and undistorted voice at 60-70mph. The only thing that could be a problem is the control panel and the number of things you have to control with only four buttons. It’s really tricky at first, but it gets easier with time. The user manual is maybe a little bit harder to understand (but it’s still much better than the PACKTALK manual). On the other hand, there’s a lot of useful YouTube tutorials where you can learn everything. FREECOM 4 does exactly what is supposed to do. We could complain about the lack of some advanced features like voice commands or DMC mesh intercom, but you can’t get everything at this price point, especially if you are buying a top-quality communication device from Cardo or Sena. If you riding in a large group (more than 4 riders), you should consider buying something more capable and more expensive (like PACKTALK, Sena 20S or 30K). For all the other purposes, FREECOM 4 is a great choice. If you are looking for a cheap option that does the basic things, you should check out Yideng Bluetooth headset. When it comes to inexpensive Bluetooth motorcycle helmet speakers, we are more into FreedConn devices, but Yideng is also a viable option. You can have a pair of these for less than $100. Yideng Bluetooth headset comes in a simple cardboard box. 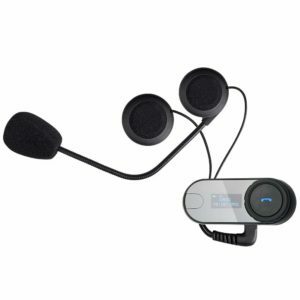 Along with the main unit, you will get the speakers and the boom mic (they are connected together), semi-coiled audio cable, USB to micro USB charging cable (wall adapter included), installation equipment (headset clip, screws, screwdriver), user manual, and 1-year warranty. This is another simple-looking device similar to all the previous ones. The control buttons are on the front and top side while the charging port and 2.5mm port (you can use it to connect any non-Bluetooth source) are located at the bottom. Charging port is, at the same time, the headset socket. When it comes to durability, this is not the most impressive device but it’s solidly built and it looks rugged. The manufacturer claims it’s waterproof but we haven’t been able to find any info on the actual IP certification. The installation doesn’t take too long. The spring clip that’s supposed to keep the unit in place is made of plastic and it doesn’t look that strong, but it keeps the unit in place. You can always use the adhesive plate instead of spring clip if you think that’s a better option. The control buttons are simple, easily reachable, and responsive. Phone/media button and intercom button are located on the front side. Two volume buttons are on the top. Since there are no too much features, you will learn how to use the buttons quickly. Yideng Bluetooth headset features Bluetooth 3.0. It doesn’t support multipoint Bluetooth pairing and you can only pair one device (phone, GPS) with the headset. Yideng also features intercom. You can only connect with two other riders and only two can talk at the same time (no intercom conference). The advertised range is 1km (under ideal conditions – the line of sight) but you will get less than 400m in reality. The battery can deliver up to 8 hours of talk time or 10 days in standby mode. The recharge takes more than 3 hours. The speakers are not the most impressive part of this headset. There’s practically no bass at all, but the mids and vocals sound pretty clear. The speakers are good for vocal-oriented music and for communication. The microphone is usable, we could even say really good. It’s not as good as Sena or Cardo, but it does attenuate a significant amount of noise. The conversation is pretty clear at 60mph. Well, you get what you paid for. This is not the best device on the market and it cannot compete with Cardo and Sena Bluetooth motorcycle helmet speakers, but it does what’s supposed to do. The intercom range is questionable but you will get at least 100-200m. If you are riding in a large pack, this device is not for you. If you prefer riding alone or in a pair, this is a pretty decent budget option. All those fancy features you would get with more expensive models are not available here. You won’t get voice prompts and voice commands, app, multipoint Bluetooth pairing, etc. This is the end of our list of 10 best motorcycle helmet speakers, but we have a little extra for you. If you prefer a cleaner and more convenient solution, you can buy a Bluetooth-enabled motorcycle helmet with built-in speakers and mic instead of a Bluetooth motorcycle helmet speaker. If you opt for this solution, you will avoid all the installation hassle but you will have to spend more. ILM 953 is a full-size helmet with a flip-up visor. It’s available in three sizes (M, L, XL) and three colors (black, red, white). The helmet meets ECE and DOT requirements. All the inner pads can be removed and replaced. The helmet doesn’t feature anti-fog visors. 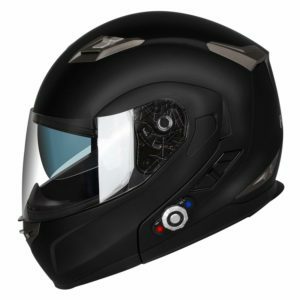 The helmet features Bluetooth 3.0 and it doesn’t support multipoint Bluetooth pairing. ILM 953 does feature intercom but it works only with other ILM 953 helmets. Three riders can be connected via intercom but only two riders can communicate at the same time (no intercom conference). The advertised intercom range is 1000ft. In reality, you will get less than 500ft. The built-in speakers and microphone deliver pretty good performance for the price. This is a great budget helmet. TORC T14B is a full-face helmet with a drop-down sun visor. It comes in many colors and sizes (XS, S, M, L, XL, XXL). The visor is anti-fog and anti-scratch and it’s removable/replaceable. You can choose between dark smoke, light smoke, and clear visor. The helmet is ECE certified and it meets Federal Motor Vehicle Safety Standards (DOT FMVSS 218). Based on the design of the controls and the look of the volume dial (it looks exactly the same as the wheel on TCOM-SC and T-COMVB), this helmet was made in cooperation with FreedConn which, as you probably remember, makes cheap Bluetooth motorcycle helmet speakers and communication devices. That’s one of the reasons why TORC T14B is so affordable. The communication device is simple and easy to use but you won’t be blown away. The helmet features Bluetooth 2.0. It allows you to connect one Bluetooth-enabled device (either your phone, GPS device, or any other Bluetooth-enabled audio source). You can answer/make calls or listen to some music from your phone. Intercom is also supported, but you can connect with only one driver. This is not a good choice if you are riding in a group and want to communicate with more than one group member. The advertised intercom range is 400m (under ideal circumstances), but you should stay within 100m range if you want a clear communication. The battery is quite impressive – it delivers up to 24 hours of talk time and the recharge takes 4-5 hours. The speakers are not the greatest but they are usable, while the mic is pretty awful and it doesn’t isolate the noise well. You will have to reduce your speed to 30mph or 40mph to make the communication clearer. This is another affordable (under $200) modular helmet with a drop-down visor. It comes in four colors (gloss black, matte black, white, and red) and three sizes. The shell is made of ABS and it’s very light. The helmet is ECE and DOT certified. All the paddings, as well as the sun visor, are easily removable. The helmet features FreedConn communication system. It utilizes Bluetooth 3.0 and can be paired to your phone, your GPS device, mp3 player or any other Bluetooth-enabled device. You can stay in touch with 2 other riders but you can only communicate with one at a time (intercom conference mode is not supported). You can also use the device to listen to FM radio. The controls are basically the same as the controls on the previous two helmets (2 volume buttons and one wheel/multifunction button). The battery delivers up to 12h of talking on the phone or 9h of intercom use. The recharge takes up to 5 hours (wall charger is not included). The speakers are decent, but the bass is absolutely nonexistent. On the other hand, all the voices sound pretty natural and clear. The mic is not the best and it doesn’t isolate all the noise but it’s usable. 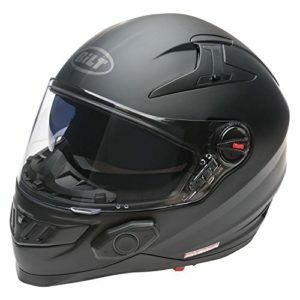 Bilt Techno 2.0 is pricier than the previous helmets because it features Sena DWO-5 communication system. This is a full-face helmet with a drop-down clear visor and built-in sunglasses. It’s available in 6 sizes (XS, S, M, L, XL, and XXL) and 3 colors (black, matte black, white). 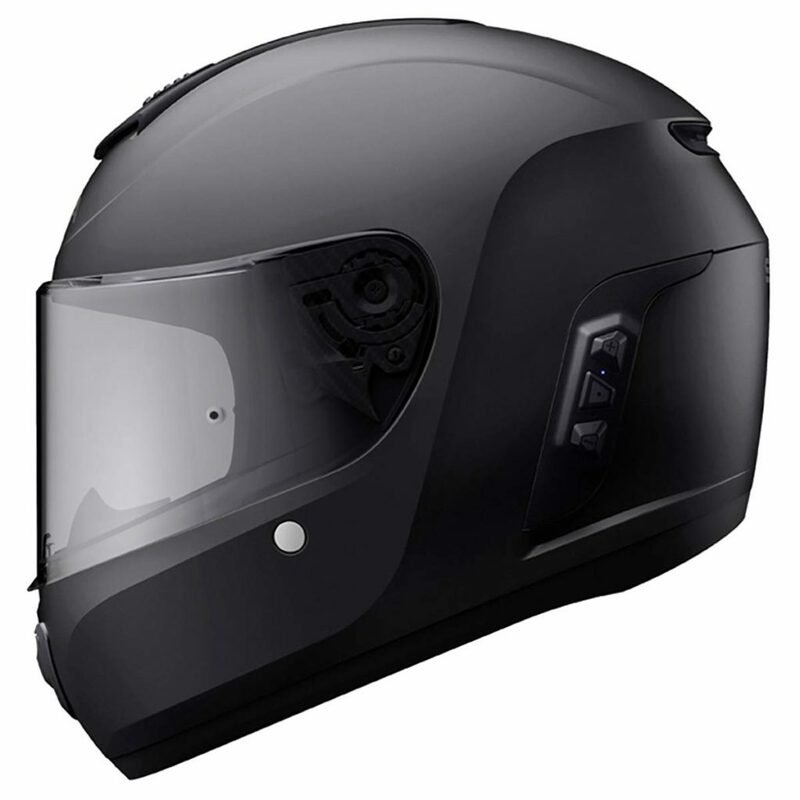 The helmet meets all the safety standards (ECE, DOT) and it’s quite light and comfortable. The communication device is made by Sena. 3-button control panel is located on the left side. It is easily reachable and simple to use. The device features Bluetooth 3.0. It can be paired with 2 Bluetooth-enabled devices simultaneously. It also supports intercom. You can pair up to four helmets, but you can only communicate with one at a time. You can also connect the helmet to other Sena communication devices (universal intercom). The intercom range is 400m under ideal conditions (it’s probably smarter to stay within 100 or 200m range). You can also share music with your passenger via Bluetooth. The battery delivers up to 7 hours of talk time while the recharge takes 2-3h. The built-in speakers, as well as noise-canceling mic, deliver good performance. The mic doesn’t actually isolate all the noise at 60mph and it’s not exactly on par with pricier Sena headsets, but it’s usable. 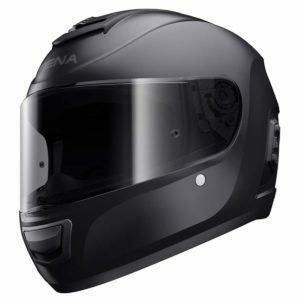 If you are looking for a helmet with a high-end communication system, Sena Momentum Lite is a viable option. 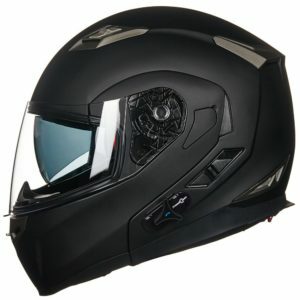 This is actually an entry-level Sena Bluetooth helmet and if you want even more features and more advanced communication system (voice commands, built-in camera, larger intercom group), you should check out other helmets from the Momentum series – Sena Momentum, Momentum INC, and Momentum Pro. Momentum Lite is a full-face helmet with a drop-down face shield. It’s ECE and DOT certified. The helmet is available in 6 sizes (XS, S, M, L, XL, and XXL) and 2 colors (glossy white and matte black). The helmet is light and looks solid. This helmet basically has Sena’s 10S communication headset built inside. The communication device utilizes Bluetooth 4.1. Bluetooth pairing is also enabled and you can pair two Bluetooth-enabled devices simultaneously with it. 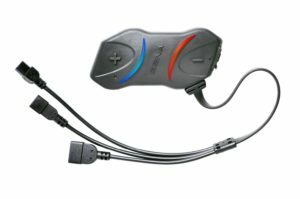 Momentum Lite allows you to connect with up to 3 other riders (intercom) and have intercom conference. The advertised intercom range under ideal conditions (line of sight) is 1.6km (1 mile). In reality, you can get up to 500m. The device also features useful voice prompts (not voice commands) and FM tuner. The built-in speakers deliver clear and loud but not the most detailed sound. The bass is weak and practically has no impact. The microphone reduces the ambient noise pretty well. In order to configure all the settings, make a group, select FM presets, etc., you can use the Sena smartphone app. Learning how to use the buttons will take some time since you have to do everything with only three buttons. Before you go away, there are a few more things we want to discuss. 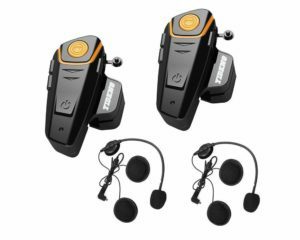 There are a lot of features to consider before purchasing the right Bluetooth motorcycle helmet speaker and the process of choosing the right one can be quite confusing and time-consuming. That’s why we’ve made a short buyer’s guide. There’s a lot of things to pay attention to, including your helmet, ease of use, comfort, durability, Bluetooth version, multipoint pairing, intercom feature, battery life, mic quality, sound quality, and price. If you already have a helmet, it’s important to see if the helmet is compatible with the speaker. Some speakers are designed for so-called Bluetooth-ready helmets and if you are buying a Bluetooth motorcycle helmet speaker you should check if it’s compatible with your helmet. Most of the units on our list can be installed on any helmet (full-face, modular, open-face). The control buttons have to be easily accessible and responsive. You need super-simple controls with large control buttons. You don’t need a bunch of buttons. Two, three, or four buttons should be more than enough. If there are parts that go inside the helmet, they must not interfere with the helmet and they have to be ‘’comfortable enough’’. Now, ‘’comfortable enough’’ is a subjective category and we can’t determine what’s comfortable for you. If there are parts of the speaker outside the helmet, they have to be resistant to different weather conditions like wind and rain. It’s recommended to look for waterproof Bluetooth motorcycle helmet speakers but, as you know, only Cardo makes units that are certified as waterproof and dustproof. All the other devices are more or less weather resistant. This one is pretty simple. Newer Bluetooth version means better connection quality and stability, greater Bluetooth range, and lower power consumption (longer playtime). It also means that you get to pair more devices with the speaker. In short, you should look for one of the latest Bluetooth versions. The only problem is – speakers featuring Bluetooth 4.0, 4.1, or 4.2 are usually more expensive than the speakers with Bluetooth 2.0 + EDR. In the end, it’s all about making compromises, especially if you are on a budget. If you have two phones or phone and GPS device, you need a speaker that can be simultaneously paired with at least 2 devices. This feature is not mandatory but it’s surely desirable. If you are riding in a pack and you want to communicate with other pack members, this feature is ‘’must have’’. The cheaper devices feature only Bluetooth intercom which enables communication between 2,3, or 4 group members, while the more expensive high-end devices feature mesh intercom which enables communication between more than 4 group members. The mesh intercom enables riders to have a group chat (intercom conference) and extends the intercom range (up to 5 miles). If you are going to make/answer calls and communicate with other pack members via intercom while riding, mic quality is of crucial importance. The microphone has to be noise-canceling if you want your voice to be loud and clear on the other end. There could be a lot of cars and trucks around you and if the mic picks up all that noise, the person on the other end won’t hear anything. Just like the Bluetooth version, this one is not a brainer. The battery should last as long as possible, but it also depends on your needs. If you are about to spend 12h on the road, the battery should last at least 12 hours. If you don’t need such a long playtime/talk time, you can buy something cheaper. If money is not an issue, you should buy the best possible device (even if you don’t need long playtime). The sound quality is, naturally, the most important thing when talking about speakers. Just to be clear, you can’t really expect Sennheiser or Beyerdynamic sound quality from a motorcycle helmet speaker, but you can still get a decent sound quality. The midrange reproduction is probably the most important thing if you are going to use your speaker for communication (via Bluetooth or via intercom). The mids have to be loud, clear, and undistorted at high volumes. Ideally, you should find something with impactful but not overwhelming bass, perfectly clear mids (especially vocals), and detailed highs (you can’t expect sparkling highs). This entirely depends on your budget but, in our opinion, you should not spend less than $50 per unit. Motorcycle helmet speakers are often sold in pairs or in bundles, and the price per one device can go up to $250. If you are about to go on a trip with your pack and you want to be in contact with all of them, you should buy a bundle. Basically, you should be looking for the same things you would be looking for in a Bluetooth motorcycle helmet speaker, but there are some additional things. You should check the size of the helmet. If there’s no helmet in your size, there’s no point in buying it. Furthermore, even if there is a helmet in your size, you should check if it’s comfortable enough – is it heavy or light, are the paddings thick enough, etc. The helmet can also be made of different materials. Some of them are more durable and impact resistant than others (look for helmets with EPS (impact absorbent expanded Polystyrene) and ABS (impact resistant thermoplastic) labels). In the end, the helmet has to meet certain safety standards (ECE – Economic Commission for Europe, DOT – Department of Transport FMVSS218 standard). This is a very useful but not absolutely necessary feature. It’s good for recording your trip in case you want to share the video with your friends. Even more importantly, it can be very useful in case of an accident. There’s no better way to prove your innocence than having the actual recording of the incident. So, it’s not mandatory but it’s very much desirable. PrevWhat are the Parts of a Stereo System? Anyone knows how many people can talk with this helmet speakers at the same time? That depends on the model you choose. Those more expensive ones (Sena and Cardo Scala) are much more capable in terms of range, build quality, allowed number of members in group intercom, etc. 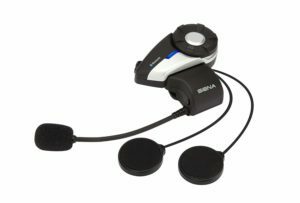 For example, Sena 20S-01D headset allows you to make an intercom group of 8 people and has the range of up to 2km (under ideal conditions and within the line of sight). Scala Rider Packtalk allows you to communicate with 14 other members of your pack. 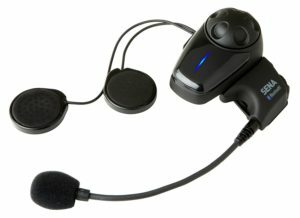 Cheaper headset will enable you to talk with up to 3 (sometimes only one) members of your group.